Harold Earl Edmund Lovell is an Antiguan politician and senator and former Cabinet Minister. He attended the Antigua Grammar School and obtained his tertiary education at the University of the West Indies where he obtained his Bachelor's Degree in Geography and Geology and was Vice President of the Guild of Undergraduates. In 1984, he went on to study at the Thames Valley University and Middle Temple, where he qualified as a Barrister-at-Law. He also holds a Master of Jurisprudence Degree from the University of Birmingham. While in England, he served on the British Broadcasting Corporation (BBC) Advisory Council for Leicestershire, England. Lovell started his professional career at the Antigua Public Utilities Authority (APUA). In 1978, he entered the teaching profession and taught dozens of students at the Antigua Grammar School and at the Antigua State College. Lovell fought for justice for our teachers as General Secretary of the Antigua & Barbuda Union of Teachers and in politics as the General Secretary and Vice Chairman of the Antigua Caribbean Liberation Movement (ACLM) and the Vice Chairman of the United Progressive Party (UPP). After the UPP victory in 2004, Lovell, then parliamentary representative for St. John's City East, was appointed Minister of Tourism, Aviation, Culture and the Environment. In 2009 he became Minister of Finance, the Economy and Public Administration. 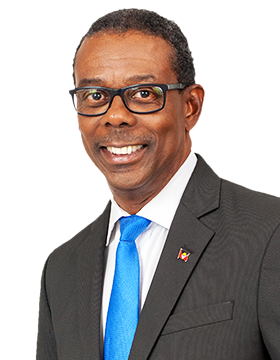 Lovell lost his seat in the 12 June 2014 general election to Melford Nicholas of the Antigua and Barbuda Labour Party. He was appointed one of four UPP senators, but replaced on 12 Augusst 2014. In May 2015, Lovell won the leadership of the United Progressive Party and returned to the Senate on 1 October 2015. He unsuccessfully led the UPP to defeat in the 2018 general election. The Antigua and Barbuda Labour Party (ABLP) won 15 of 17 seats, with the UPP and the Barbuda People's Movement (BPM) each winning one seat. Lovell failed to recapture his St. John's Citu East seat from incumbent Melford Nicholas.